FBI counterintelligence agent Peter Strzok reportedly ignored "an irregularity in the metadata" indicating that Hillary Clinton's server may had been breached, while FBI top brass made significant edits to former Director James Comey's statement specifically minimizing how likely it was that hostile actors had gained access. In December, a letter from Senate Homeland Security Committee Chair Ron Johnson (R-WI) revealed that Strzok and other FBI officials effectively "decriminalized" Clinton's behavior through a series of edits to James Comey's original statement. The letter described how outgoing Deputy Director Andrew McCabe exchanged drafts of Comey's statement with senior FBI officials, including Strzok, Strzok's direct supervisor, E.W. "Bill" Priestap, Jonathan Moffa, and an unnamed employee from the Office of General Counsel (identified by Newsweek as DOJ Deputy General Counsel Trisha Anderson) - in a coordinated conspiracy among top FBI brass. 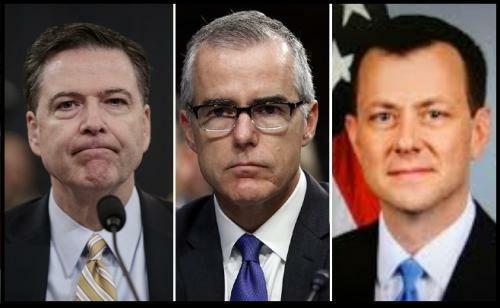 It was already known that Strzok - who was demoted to the FBI's HR department for sending anti-Trump text messages to his mistress - downgraded the language describing Clinton's conduct from the criminal charge of "gross negligence" to "extremely careless." Notably, "Gross negligence" is a legal term of art in criminal law often associated with recklessness. According to Black's Law Dictionary, it is defined as “A severe degree of negligence taken as reckless disregard," and "Blatant indifference to one's legal duty, other's safety, or their rights.” "Extremely careless," on the other hand, is not a legal term of art. In order to justify downgrading Clinton's behavior to "extremely careless," however, FBI officials also needed to minimize the impact of her crimes. As revealed in the letter from Rep. Johnson, the FBI downgraded the probability that Clinton's server was hacked by hostile actors from "reasonably likely" to "possible." “Given that combination of factors, we assess it is possible that hostile actors gained access to Secretary Clinton’s personal e-mail account,” Comey said in his statement. By doing so, the FBI downgraded Clinton's negligence - thus supporting the "extremely careless" language. The FBI also edited Clinton's exoneration letter to remove a reference to the "sheer volume" of classified material on the private server, which - according to the original draft "supports an inference that the participants were grossly negligent in their handling of that information." Furthermore, all references to the Intelligence Community's involvement in investigating Clinton's private email server were removed as well. W]e have done extensive work with the assistance of our colleagues elsewhere in the Intelligence Community to understand what indications there might be of compromise by hostile actors in connection with the private email operation. In summary; the FBI launched an investigation into Hillary Clinton's private server, ignored evidence it may have been hacked, downgraded the language in Comey's draft to decriminalize her behavior, and then exonerated her by recommending the DOJ not prosecute. Meanwhile, a tip submitted by an Australian diplomat tied to a major Clinton Foundation deal launched the FBI's counterintelligence operation against the Trump campaign - initially spearheaded by the same Peter Strzok who worked so hard to get Hillary off the hook. And Strzok still collects a taxpayer-funded paycheck.